I was just talking last week with a few different friends actually about a mantra that I keep repeating to myself lately, ” I will not base my happiness on my relationship with ANYONE other than the relationship with MYSELF.” I need to be my own best friend. 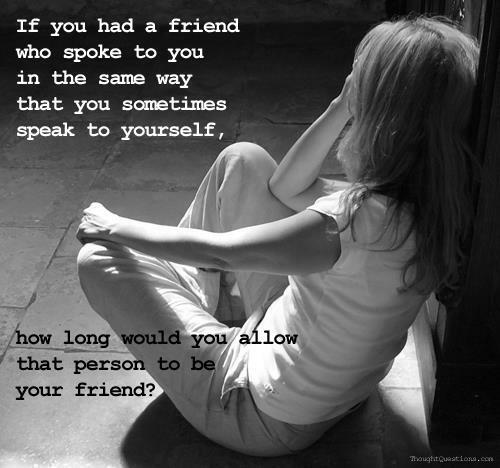 As the picture says below, you wouldn’t speak badly to a friend, so why do the same to yourself? You’re all you have at the end of the day, and if you can’t be happy with yourself you won’t ever be happy with anyone. NO ONE can love you until you do. I’m guilty as charged here! I’m so negative about ME sometimes when I tell others to be so positive about THEM. Why don’t I deserve the same from myself? There is no reason I don’t. I will work on being kind to MYSELF, I hope you all will do the same!